Ah, the lasso of Truth. You know it, we know it. This golden lasso is a pretty big deal. But especially to you! Because you're not any regular lady, you have something particularly epic in your destiny. You've chosen a Wonder Woman costume and you're planning on saving the day! Which means you're going need to get your hands on a lasso of your own. Well, friend, we've got your back! This Wonder Woman lasso is officially licensed by DC Comics. Eight and a half feet long, it's everything you need to get the truth out of out of a bad guy and it's probably pretty handy in a big-time battle, too. After all, if you're going to be dressing like Wonder Woman, you've got to have the gear to back you up. And this Lasso of Truth accessory is up for the task! This lasso measures 8 1/2 feet long. It has a hard molded plastic handle and the whip section is woven mesh that covers the LED light string. It features three light modes and it comes with a belt loop attachment to secure to your costume belt. 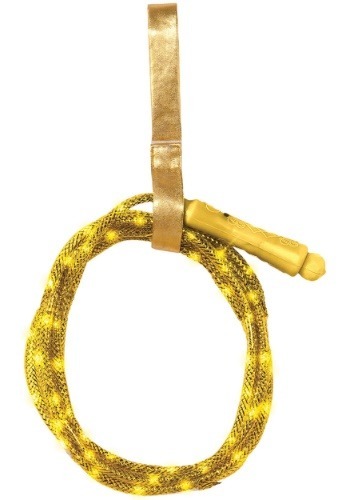 We know this lasso looks really great but unfortunately, it does not come with any special powers. And we do not recommend trying to fight bad guys with it. But when you add it to your costume getup and activate the light-up effect? You're going to look epic!